One month to the day since my first viewing and a week since my second, it doesn't seem as though there's much left to say about Les Mis that I and others haven't elsewhere. Still, I am finding it difficult to stop talking about Tom Hooper's gift to fans of film and theatre, so I will say a little more. Already counting Hugo's Les Mis on my shortlist of greatest novels and Natel/Schönberg/Boublil/Kretzmer's adaptation among my favorite musicals, my expectations on entering the Christmas premiere were unrealistically high, /GrossUnderstatement. As impressed as I was by the cinematography (18th Paris on film has rarely looked simultaneously so grungy and so gorgeously rendered), the definitively re-orchestrated score, some stellar performances (particularly from the Broadway and West End grafts, and particularly particularly Samantha Barks and Aaron Tveit), and spot-on editing, I was distracted endlessly by the strained (Hugh Jackman, Anne Hathaway) and often just plain terrible (Russell Crowe, Amanda Seyfried) singing, shaky-cam, and (as I then conceived) disastrously misguided close-up tracking shots. To belabor the point, Russell Crowe's voice is an abortion of the eardrums which, for the sake of public safety, should never again be permitted near recording equipment. Worse, his "acting" is nonexistent, save a consistently constipated expression of the strain of singing, and therefore incapable of improving the performance even to the level of sub-par. At least I could understand what Hooper was going for with the apoplectic handycam and unforgiving close-ups, even as I disagreed vehemently with the decision, but I could not forgive his casting nor account for it except as commercial calculation. I left the theater satisfied but lukewarm in my affection, counting the project a mostly successful but heavily flawed adaptation. It took a second viewing to remind me why I so deeply love Les Mis, and to recognize Hooper's adaptation as the faithful and independently successful film it is. It is not that I recanted my criticisms upon that second viewing so much as that I came to realize I had missed the forest for its most blighted trees. Les Mis more than merely "succeeds" in spite of its flaws: it flourishes, and stunningly so. 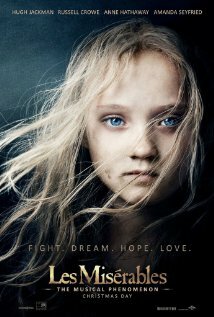 Melodrama it is and has always been, but contra the myriad critics who have seen fit to consider that a mark against it, Les Mis's sentiment is its heart and life, a violent reawakening of raw feeling at the end of a decade characterized by smug self-awareness and postmodern ironization. Hooper captures Hugo's love and understanding of humanity in its full spectrum of color and contrast. An opening shot of a titanic galleon hauled by hundreds of prisoner-slaves through sea and storm to the swells of Schönberg's revitalized overture is the very definition of breathtaking. A near-unrecognizably emaciated Jackman as Valjean is cast in constant darkness against a lit cross or icon of the Christ in opposing corners. Hathaway's Fantine sings of her living death in prostitution as she is ravished in a literal coffin, and if that imagery is heavy handed it packs a punch just the same. The starving poor huddle together at the shadowed edges of the frame, their diseased and filth-ridden complexions only occasionally lit by scraps of lights through grates and crumbling walls separating them from the few and beautiful elite. This flood of imagery reaches its crest in the second act, which pummels us with the raptures, follies, and tragedies of humanity in Marius (Eddie Redmayne) and Cosette's (Amanda Seyfried) infatuation, Eponine's (Barks) loss and longing, Enjolras's (Tveit) passion and principle, Valjean's awakening to compassion and forgiveness, Javert's (Crowe) inability to cope with a loss of identity in a changing world, and virtually every other facet of what it is to live and suffer and love and lose on this earth, all in the span of 158 minutes, making Hooper's one of the most compact and yet complete retellings of Hugo's material in its adaptive history. The word "epic" is thrown around a great deal too often (including by yours truly) in describing scope and significance, but if it ever held applicable meaning it is for Les Misérables. Whatever the cynical may label "manipulative" or "cloying" in the narrative is from my perspective a defensive reduction of what Les Mis really accomplishes here, which is to say the genuine impartment of genuine feeling. And Les Mis can cause feeling of a magnitude rarely matched, whatever its faults or whatever its methods. Or so, at least, the theater restrooms full of sobbing men of every age seemed to testify.